False-colored SEM image from B cell–derived tumor, showing transdifferentiation of B cells (aqua) becoming neoplastic macrophages (red). Kaposi’s sarcoma herpesvirus (KSHV), a human gammaherpesvirus, is the etiological agent for the endothelial-derived Kaposi’s sarcoma, and also for certain lymphoproliferative diseases. Two articles in the current issue detail what happens when KSHV infects B cells. Myoung and Ganem provide evidence that CD4+ lymphocytes suppress KSHV replication, promoting latency in B cells (page 1130) and Ballon and colleagues describe the in vivo transdifferentiation of B lymphocytes by KSHV (page 1141). Citation Information: J Clin Invest. 2011;121(3):823-823. https://doi.org/10.1172/JCI57370. Citation Information: J Clin Invest. 2011;121(3):824-824. https://doi.org/10.1172/JCI57365. Citation Information: J Clin Invest. 2011;121(3):825-825. https://doi.org/10.1172/JCI45953. Citation Information: J Clin Invest. 2011;121(3):826-826. https://doi.org/10.1172/JCI46158. Citation Information: J Clin Invest. 2011;121(3):827-835. https://doi.org/10.1172/JCI45434. Food allergies affect up to 6% of young children and 3%–4% of adults. They encompass a range of disorders that may be IgE and/or non-IgE mediated, including anaphylaxis, pollen food syndrome, food-protein–induced enterocolitis syndrome, food-induced proctocolitis, eosinophilic gastroenteropathies, and atopic dermatitis. Many complex host factors and properties of foods are involved in the development of food allergy. With recent advances in the understanding of how these factors interact, the development of several novel diagnostic and therapeutic strategies is underway and showing promise. Citation Information: J Clin Invest. 2011;121(3):836-838. https://doi.org/10.1172/JCI46400. Mutations in GLI3, a component of the Sonic Hedgehog (Shh) signaling pathway, cause a variety of human developmental syndromes. In this issue of the JCI, Cain and colleagues show that tightly regulated GLI3 repressor activity is essential for Shh-dependent differentiation of upper urinary tract pacemaker cells and the efficient flow of urine from the kidney to the bladder. These results link defective pacemaker cell differentiation with hydronephrosis and provide a cellular basis for one of the abnormal renal defects observed in humans with the GLI3-linked disease Pallister-Hall syndrome. Citation Information: J Clin Invest. 2011;121(3):838-841. https://doi.org/10.1172/JCI46499. Kaposi sarcoma herpesvirus (KSHV), a human gammaherpesvirus, is the etiological agent for the endothelial-derived Kaposi sarcoma (KS) and also for certain lymphoproliferative disorders. In these lymphoproliferations, the KSHV-infected cells carry the stigmata of B lymphocytes, with plasmablastic features. 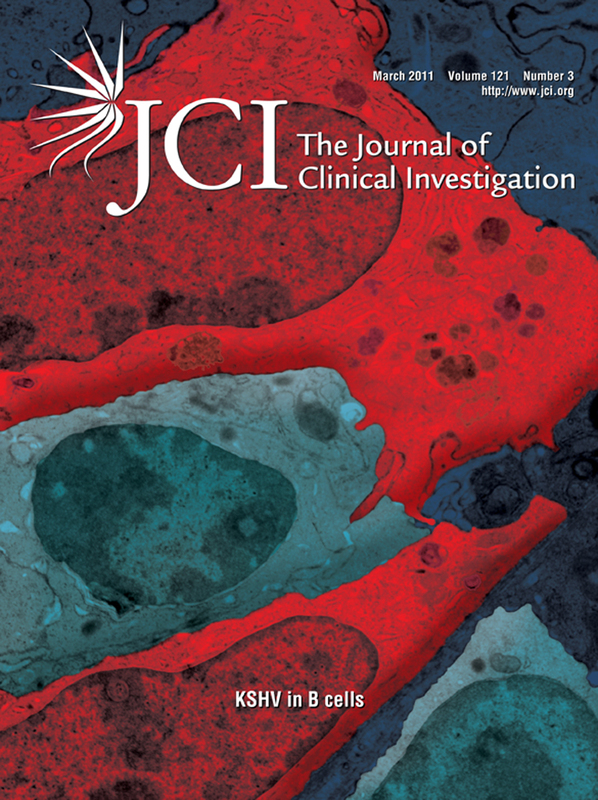 The JCI has published three manuscripts addressing key questions related to B cell infection and viral latent expression in B cells. Myoung and Ganem provide evidence that CD4+ lymphocytes suppress KSHV replication, promoting latency in B cells; Hassman and colleagues show that KSHV infection drives plasmablast differentiation in a subset of IgM+ λ light chain–expressing cells; and Ballon and colleagues describe the in vivo transdifferentiation of B lymphocytes by KSHV-encoded viral FLICE-inhibitory protein (vFLIP). Citation Information: J Clin Invest. 2011;121(3):841-844. https://doi.org/10.1172/JCI46333. The role of adherent-invasive E. coli (AIEC) in Crohn disease (CD) has been in debate for decades. AIEC bacteria are found in the small intestine of patients with chronic CD, but it has remained unclear whether this infection is causal or secondary to underlying immune deficiencies in CD patients. In this issue of the JCI, Chassaing and colleagues demonstrate that AIEC bacteria express an adherence factor called long polar fimbriae (LPF) that aids in the binding of these bacteria to M cells overlying Peyer’s patches and subsequent entry into lymphoid tissue. These findings provide a mechanism of AIEC penetration but do not prove that AIEC is causing a primary infection in the Peyer’s patches that is necessary for the initiation or persistence of CD inflammation. Citation Information: J Clin Invest. 2011;121(3):844-847. https://doi.org/10.1172/JCI46399. In this issue of the JCI, Wu et al. and Marin et al. describe two new mouse models of inherited disorders of the RAS/MAPK signal transduction pathway that display hypertrophic cardiomyopathy (HCM); the model from the former paper was from a gain-of-function Raf1 mutation, and the model from the latter paper was from a protein tyrosine phosphatase, non-receptor type 11 (Ptpn11) mutated allele encoding Shp2 with impaired catalytic function. The two groups show that HCM arises from increased signaling through Erk1/2 and the mTor complex 1, respectively, and that those cardiac issues can be prevented or reversed with small-molecule therapies inhibiting the appropriate pathway. Aside from being the first studies of treatment for Noonan syndrome and related disorders in a mammalian system, these papers provide important insights into the role of RAS signaling in cardiac hypertrophy and suggest the complexity in developing meaningful therapy for individuals with these RASopathies. Citation Information: J Clin Invest. 2011;121(3):848-850. https://doi.org/10.1172/JCI46418. Hepatitis A virus (HAV) usually results in asymptomatic infection or mild disease, but in a small subset of patients it can lead to severe disease and even liver failure. In this issue of the JCI, Kim et al. identify a polymorphism associated with this increased disease risk in the gene that encodes the HAV receptor — TIM1. Importantly, this TIM1 gene polymorphism protects from the development of atopic diseases in HAV-seropositive individuals. Citation Information: J Clin Invest. 2011;121(3):851-865. https://doi.org/10.1172/JCI44111. The mammalian constitutive photomorphogenesis 9 (COP9) signalosome (CSN), a protein complex involved in embryonic development, is implicated in cell cycle regulation and the DNA damage response. Its role in tumor development, however, remains unclear. Here, we have shown that the COP9 subunit 6 (CSN6) gene is amplified in human breast cancer specimens, and the CSN6 protein is upregulated in human breast and thyroid tumors. CSN6 expression positively correlated with expression of murine double minute 2 (MDM2), a potent negative regulator of the p53 tumor suppressor. Expression of CSN6 appeared to prevent MDM2 autoubiquitination at lysine 364, resulting in stabilization of MDM2 and degradation of p53. Mice in which Csn6 was deleted died early in embryogenesis (E7.5). Embryos lacking both Csn6 and p53 survived to later in embryonic development (E10.5), which suggests that loss of p53 could partially rescue the effect of loss of Csn6. Mice heterozygous for Csn6 were sensitized to γ-irradiation–induced, p53-dependent apoptosis in both the thymus and the developing CNS. These mice were also less susceptible than wild-type mice to γ-irradiation–induced tumorigenesis. These results suggest that loss of CSN6 enhances p53-mediated tumor suppression in vivo and that CSN6 plays an important role in regulating DNA damage–associated apoptosis and tumorigenesis through control of the MDM2-p53 signaling pathway. Citation Information: J Clin Invest. 2011;121(3):866-879. https://doi.org/10.1172/JCI42928. Understanding the molecular pathways that contribute to the aggressive behavior of human cancers is a critical research priority. The SNF1/AMPK-related protein kinase Hunk is overexpressed in aggressive subsets of human breast, ovarian, and colon cancers. Analysis of Hunk–/– mice revealed that this kinase is required for metastasis of c-myc–induced mammary tumors but not c-myc–induced primary tumor formation. Similar to c-myc, amplification of the proto-oncogene HER2/neu occurs in 10%–30% of breast cancers and is associated with aggressive tumor behavior. By crossing Hunk–/– mice with transgenic mouse models for HER2/neu-induced mammary tumorigenesis, we report that Hunk is required for primary tumor formation induced by HER2/neu. Knockdown and reconstitution experiments in mouse and human breast cancer cell lines demonstrated that Hunk is required for maintenance of the tumorigenic phenotype in HER2/neu-transformed cells. This requirement is kinase dependent and resulted from the ability of Hunk to suppress apoptosis in association with downregulation of the tumor suppressor p27kip1. Additionally, we find that Hunk is rapidly upregulated following HER2/neu activation in vivo and in vitro. These findings provide what we believe is the first evidence for a role for Hunk in primary tumorigenesis and cell survival and identify this kinase as an essential effector of the HER2/neu oncogenic pathway. Citation Information: J Clin Invest. 2011;121(3):880-892. https://doi.org/10.1172/JCI40433. Citation Information: J Clin Invest. 2011;121(3):893-904. https://doi.org/10.1172/JCI44504. The transcription factor p53 is a tumor suppressor. As such, the P53 gene is frequently altered in human cancers. However, over 80% of the P53 mutations found in human cancers are missense mutations that lead to expression of mutant proteins that not only lack p53 transcriptional activity but exhibit new functions as well. Recent studies show that restoration of p53 expression leads to tumor regression in mice carrying p53 deletions. However, the therapeutic efficacy of restoring p53 expression in tumors containing p53 missense mutations has not been evaluated. Here we demonstrate that restoring wild-type p53 expression halted tumor growth in mice inheriting a p53R172H missense mutation that is equivalent to a P53 missense mutation detected in approximately 6% of human cancers. However, it did not lead to tumor regression, as was observed in mice lacking p53. We further showed that the dominant-negative effect of the mutant p53 encoded by p53R172H dampened the activity of the restored wild-type p53. We therefore conclude that in a mutant p53 background, p53 restoration has the therapeutic potential to suppress tumor progression. Our findings support using p53 restoration as a strategy to treat human cancers with P53 missense mutations and provide direction for optimizing p53 restoration in cancer therapy. Citation Information: J Clin Invest. 2011;121(3):905-917. https://doi.org/10.1172/JCI43690. Recent collaborative efforts have subclassified malignant glioblastomas into 4 clinical relevant subtypes based on their signature genetic lesions. Platelet-derived growth factor receptor α (PDGFRA) overexpression is concomitant with a loss of cyclin-dependent kinase inhibitor 2A (CDKN2A) locus (encoding P16INK4A and P14ARF) in a large number of tumors within one subtype of glioblastomas. Here we report that activation of PDGFRα conferred tumorigenicity to Ink4a/Arf-deficient mouse astrocytes and human glioma cells in the brain. Restoration of p16INK4a but not p19ARF suppressed PDGFRα-promoted glioma formation. Mechanistically, abrogation of signaling modules in PDGFRα that lost capacity to bind to SHP-2 or PI3K significantly diminished PDGFRα-promoted tumorigenesis. Furthermore, inhibition of SHP-2 by shRNAs or pharmacological inhibitors disrupted the interaction of PI3K with PDGFRα, suppressed downstream AKT/mTOR activation, and impaired tumorigenesis of Ink4a/Arf-null cells, whereas expression of an activated PI3K mutant rescued the effect of SHP-2 inhibition on tumorigenicity. PDGFRα and PDGF-A are co-expressed in clinical glioblastoma specimens, and such co-expression is linked with activation of SHP-2/AKT/mTOR signaling. Together, our data suggest that in glioblastomas with Ink4a/Arf deficiency, overexpressed PDGFRα promotes tumorigenesis through the PI3K/AKT/mTOR-mediated pathway regulated by SHP-2 activity. These findings functionally validate the genomic analysis of glioblastomas and identify SHP-2 as a potential target for treatment of glioblastomas. Citation Information: J Clin Invest. 2011;121(3):918-929. https://doi.org/10.1172/JCI41940. Insulin resistance in skeletal muscle is a key phenotype associated with type 2 diabetes (T2D) for which the molecular mediators remain unclear. We therefore conducted an expression analysis of human muscle biopsies from patients with T2D; normoglycemic but insulin-resistant subjects with a parental family history (FH+) of T2D; and family history-negative control individuals (FH–). Actin cytoskeleton genes regulated by serum response factor (SRF) and its coactivator megakaryoblastic leukemia 1 (MKL1) had increased expression in T2D and FH+ groups. Furthermore, striated muscle activator of Rho signaling (STARS), an activator of SRF, was upregulated in T2D and FH+ and was inversely correlated with insulin sensitivity. Skeletal muscle from insulin-resistant mice recapitulated this gene expression pattern and showed reduced G-actin and increased nuclear localization of MKL1, each of which regulates SRF activity. Overexpression of MKL1 or reduction in G-actin decreased insulin-stimulated Akt phosphorylation, whereas reduction of STARS expression increased insulin signaling and glucose uptake. Pharmacological SRF inhibition by CCG-1423 reduced nuclear MKL1 and improved glucose uptake and tolerance in insulin-resistant mice in vivo. Thus, SRF pathway alterations are linked to insulin resistance, may contribute to T2D pathogenesis, and could represent therapeutic targets. Citation Information: J Clin Invest. 2011;121(3):930-940. https://doi.org/10.1172/JCI43871. The transcription factors in the myocyte enhancer factor 2 (MEF2) family play important roles in cell survival by regulating nuclear gene expression. Here, we report that MEF2D is present in rodent neuronal mitochondria, where it can regulate the expression of a gene encoded within mitochondrial DNA (mtDNA). Immunocytochemical, immunoelectron microscopic, and biochemical analyses of rodent neuronal cells showed that a portion of MEF2D was targeted to mitochondria via an N-terminal motif and the chaperone protein mitochondrial heat shock protein 70 (mtHsp70). MEF2D bound to a MEF2 consensus site in the region of the mtDNA that contained the gene NADH dehydrogenase 6 (ND6), which encodes an essential component of the complex I enzyme of the oxidative phosphorylation system; MEF2D binding induced ND6 transcription. Blocking MEF2D function specifically in mitochondria decreased complex I activity, increased cellular H2O2 level, reduced ATP production, and sensitized neurons to stress-induced death. Toxins known to affect complex I preferentially disrupted MEF2D function in a mouse model of Parkinson disease (PD). In addition, mitochondrial MEF2D and ND6 levels were decreased in postmortem brain samples of patients with PD compared with age-matched controls. Thus, direct regulation of complex I by mitochondrial MEF2D underlies its neuroprotective effects, and dysregulation of this pathway may contribute to PD. Citation Information: J Clin Invest. 2011;121(3):956-965. https://doi.org/10.1172/JCI43475. Fluid and HCO3– secretion are fundamental functions of epithelia and determine bodily fluid volume and ionic composition, among other things. Secretion of ductal fluid and HCO3– in secretory glands is fueled by Na+/HCO3– cotransport mediated by basolateral solute carrier family 4 member 4 (NBCe1-B) and by Cl–/HCO3– exchange mediated by luminal solute carrier family 26, member 6 (Slc26a6) and CFTR. However, the mechanisms governing ductal secretion are not known. Here, we have shown that pancreatic ductal secretion in mice is suppressed by silencing of the NBCe1-B/CFTR activator inositol-1,4,5-trisphosphate (IP3) receptor–binding protein released with IP3 (IRBIT) and by inhibition of protein phosphatase 1 (PP1). In contrast, silencing the with-no-lysine (WNK) kinases and Ste20-related proline/alanine-rich kinase (SPAK) increased secretion. Molecular analysis revealed that the WNK kinases acted as scaffolds to recruit SPAK, which phosphorylated CFTR and NBCe1-B, reducing their cell surface expression. IRBIT opposed the effects of WNKs and SPAK by recruiting PP1 to the complex to dephosphorylate CFTR and NBCe1-B, restoring their cell surface expression, in addition to stimulating their activities. Silencing of SPAK and IRBIT in the same ducts rescued ductal secretion due to silencing of IRBIT alone. These findings stress the pivotal role of IRBIT in epithelial fluid and HCO3– secretion and provide a molecular mechanism by which IRBIT coordinates these processes. They also have implications for WNK/SPAK kinase–regulated processes involved in systemic fluid homeostasis, hypertension, and cystic fibrosis. Citation Information: J Clin Invest. 2011;121(3):966-975. https://doi.org/10.1172/JCI44632. Crohn disease (CD) is a multifactorial disease in which an abnormal immune response in the gastrointestinal (GI) tract leads to chronic inflammation. The small intestine, particularly the ileum, of patients with CD is colonized by adherent-invasive E. coli (AIEC) — a pathogenic group of E. coli able to adhere to and invade intestinal epithelial cells. As the earliest inflammatory lesions are microscopic erosions of the epithelium lining the Peyer’s patches (PPs), we investigated the ability of AIEC bacteria to interact with PPs and the virulence factors involved. We found that AIEC bacteria could interact with mouse and human PPs via long polar fimbriae (LPF). An LPF-negative AIEC mutant was highly impaired in its ability to interact with mouse and human PPs and to translocate across monolayers of M cells, specialized epithelial cells at the surface of PPs. The prevalence of AIEC strains harboring the lpf operon was markedly higher in CD patients compared with controls. In addition, increased numbers of AIEC, but not LPF-deficient AIEC, bacteria were found interacting with PPs from Nod2–/– mice compared with WT mice. In conclusion, we have identified LPF as a key factor for AIEC to target PPs. This could be the missing link between AIEC colonization and the presence of early lesions in the PPs of CD patients. Citation Information: J Clin Invest. 2011;121(3):976-984. https://doi.org/10.1172/JCI42650. Defects in cholesterol synthesis result in a wide variety of symptoms, from neonatal lethality to the relatively mild dysmorphic features and developmental delay found in individuals with Smith-Lemli-Opitz syndrome. We report here the identification of mutations in sterol-C4-methyl oxidase–like gene (SC4MOL) as the cause of an autosomal recessive syndrome in a human patient with psoriasiform dermatitis, arthralgias, congenital cataracts, microcephaly, and developmental delay. This gene encodes a sterol-C4-methyl oxidase (SMO), which catalyzes demethylation of C4-methylsterols in the cholesterol synthesis pathway. C4-Methylsterols are meiosis-activating sterols (MASs). They exist at high concentrations in the testis and ovary and play roles in meiosis activation. In this study, we found that an accumulation of MASs in the patient led to cell overproliferation in both skin and blood. SMO deficiency also substantially altered immunocyte phenotype and in vitro function. MASs serve as ligands for liver X receptors α and β (LXRα and LXRβ), which are important in regulating not only lipid transport in the epidermis, but also innate and adaptive immunity. Deficiency of SMO represents a biochemical defect in the cholesterol synthesis pathway, the clinical spectrum of which remains to be defined. Citation Information: J Clin Invest. 2011;121(3):985-997. https://doi.org/10.1172/JCI44490. Uncontrolled macrophage activation is now considered to be a critical event in the pathogenesis of chronic inflammatory diseases such as atherosclerosis, multiple sclerosis, and chronic venous leg ulcers. However, it is still unclear which environmental cues induce persistent activation of macrophages in vivo and how macrophage-derived effector molecules maintain chronic inflammation and affect resident fibroblasts essential for tissue homeostasis and repair. We used a complementary approach studying human subjects with chronic venous leg ulcers, a model disease for macrophage-driven chronic inflammation, while establishing a mouse model closely reflecting its pathogenesis. Here, we have shown that iron overloading of macrophages — as was found to occur in human chronic venous leg ulcers and the mouse model — induced a macrophage population in situ with an unrestrained proinflammatory M1 activation state. Via enhanced TNF-α and hydroxyl radical release, this macrophage population perpetuated inflammation and induced a p16INK4a-dependent senescence program in resident fibroblasts, eventually leading to impaired wound healing. This study provides insight into the role of what we believe to be a previously undescribed iron-induced macrophage population in vivo. Targeting this population may hold promise for the development of novel therapies for chronic inflammatory diseases such as chronic venous leg ulcers. Citation Information: J Clin Invest. 2011;121(3):998-1008. https://doi.org/10.1172/JCI45157. The hallmark of HIV-1 and SIV infections is CD4+ T cell depletion. Both direct cell killing and indirect mechanisms related to immune activation have been suggested to cause the depletion of T cells. We have now identified a mechanism by which immune activation-induced fibrosis of lymphoid tissues leads to depletion of naive T cells in HIV-1 infected patients and SIV-infected rhesus macaques. The T regulatory cell response to immune activation increased procollagen production and subsequent deposition as fibrils via the TGF-β1 signaling pathway and chitinase 3-like-1 activity in fibroblasts in lymphoid tissues from patients infected with HIV-1. Collagen deposition restricted T cell access to the survival factor IL-7 on the fibroblastic reticular cell (FRC) network, resulting in apoptosis and depletion of T cells, which, in turn, removed a major source of lymphotoxin-β, a survival factor for FRCs during SIV infection in rhesus macaques. The resulting loss of FRCs and the loss of IL-7 produced by FRCs may thus perpetuate a vicious cycle of depletion of T cells and the FRC network. Because this process is cumulative, early treatment and antifibrotic therapies may offer approaches to moderate T cell depletion and improve immune reconstitution during HIV-1 infection. Citation Information: J Clin Invest. 2011;121(3):1009-1025. https://doi.org/10.1172/JCI44929. Hypertrophic cardiomyopathy (HCM) is a leading cause of sudden death in children and young adults. Abnormalities in several signaling pathways are implicated in the pathogenesis of HCM, but the role of the RAS-RAF-MEK-ERK MAPK pathway has been controversial. Noonan syndrome (NS) is one of several autosomal-dominant conditions known as RASopathies, which are caused by mutations in different components of this pathway. Germline mutations in RAF1 (which encodes the serine-threonine kinase RAF1) account for approximately 3%–5% of cases of NS. Unlike other NS alleles, RAF1 mutations that confer increased kinase activity are highly associated with HCM. To explore the pathogenesis of such mutations, we generated knockin mice expressing the NS-associated Raf1L613V mutation. Like NS patients, mice heterozygous for this mutation (referred to herein as L613V/+ mice) had short stature, craniofacial dysmorphia, and hematologic abnormalities. Valvuloseptal development was normal, but L613V/+ mice exhibited eccentric cardiac hypertrophy and aberrant cardiac fetal gene expression, and decompensated following pressure overload. Agonist-evoked MEK-ERK activation was enhanced in multiple cell types, and postnatal MEK inhibition normalized the growth, facial, and cardiac defects in L613V/+ mice. These data show that different NS genes have intrinsically distinct pathological effects, demonstrate that enhanced MEK-ERK activity is critical for causing HCM and other RAF1-mutant NS phenotypes, and suggest a mutation-specific approach to the treatment of RASopathies. Citation Information: J Clin Invest. 2011;121(3):1026-1043. https://doi.org/10.1172/JCI44972. LEOPARD syndrome (LS) is an autosomal dominant “RASopathy” that manifests with congenital heart disease. Nearly all cases of LS are caused by catalytically inactivating mutations in the protein tyrosine phosphatase (PTP), non-receptor type 11 (PTPN11) gene that encodes the SH2 domain-containing PTP-2 (SHP2). RASopathies typically affect components of the RAS/MAPK pathway, yet it remains unclear how PTPN11 mutations alter cellular signaling to produce LS phenotypes. We therefore generated knockin mice harboring the Ptpn11 mutation Y279C, one of the most common LS alleles. Ptpn11Y279C/+ (LS/+) mice recapitulated the human disorder, with short stature, craniofacial dysmorphia, and morphologic, histologic, echocardiographic, and molecular evidence of hypertrophic cardiomyopathy (HCM). Heart and/or cardiomyocyte lysates from LS/+ mice showed enhanced binding of Shp2 to Irs1, decreased Shp2 catalytic activity, and abrogated agonist-evoked Erk/Mapk signaling. LS/+ mice also exhibited increased basal and agonist-induced Akt and mTor activity. The cardiac defects in LS/+ mice were completely reversed by treatment with rapamycin, an inhibitor of mTOR. Our results demonstrate that LS mutations have dominant-negative effects in vivo, identify enhanced mTOR activity as critical for causing LS-associated HCM, and suggest that TOR inhibitors be considered for treatment of HCM in LS patients. Citation Information: J Clin Invest. 2011;121(3):1044-1052. https://doi.org/10.1172/JCI43844. Citation Information: J Clin Invest. 2011;121(3):1053-1063. https://doi.org/10.1172/JCI43273. The regulation of neutrophil lifespan by induction of apoptosis is critical for maintaining an effective host response and preventing excessive inflammation. The hypoxia-inducible factor (HIF) oxygen-sensing pathway has a major effect on the susceptibility of neutrophils to apoptosis, with a marked delay in cell death observed under hypoxic conditions. HIF expression and transcriptional activity are regulated by the oxygen-sensitive prolyl hydroxylases (PHD1–3), but the role of PHDs in neutrophil survival is unclear. We examined PHD expression in human neutrophils and found that PHD3 was strongly induced in response to hypoxia and inflammatory stimuli in vitro and in vivo. Using neutrophils from mice deficient in Phd3, we demonstrated a unique role for Phd3 in prolonging neutrophil survival during hypoxia, distinct from other hypoxia-associated changes in neutrophil function and metabolic activity. Moreover, this selective defect in neutrophil survival occurred in the presence of preserved HIF transcriptional activity but was associated with upregulation of the proapoptotic mediator Siva1 and loss of its binding target Bcl-xL. In vivo, using an acute lung injury model, we observed increased levels of neutrophil apoptosis and clearance in Phd3-deficient mice compared with WT controls. We also observed reduced neutrophilic inflammation in an acute mouse model of colitis. These data support what we believe to be a novel function for PHD3 in regulating neutrophil survival in hypoxia and may enable the development of new therapeutics for inflammatory disease. Citation Information: J Clin Invest. 2011;121(3):1064-1074. https://doi.org/10.1172/JCI44540. Epithelial-mesenchymal transition (EMT) is a tightly regulated process that is critical for embryogenesis but is abnormally activated during cancer metastasis and recurrence. Here we show that a switch in CD44 alternative splicing is required for EMT. Using both in vitro and in vivo systems, we have demonstrated a shift in CD44 expression from variant isoforms (CD44v) to the standard isoform (CD44s) during EMT. This isoform switch to CD44s was essential for cells to undergo EMT and was required for the formation of breast tumors that display EMT characteristics in mice. Mechanistically, the splicing factor epithelial splicing regulatory protein 1 (ESRP1) controlled the CD44 isoform switch and was critical for regulating the EMT phenotype. Additionally, the CD44s isoform activated Akt signaling, providing a mechanistic link to a key pathway that drives EMT. Finally, CD44s expression was upregulated in high-grade human breast tumors and was correlated with the level of the mesenchymal marker N-cadherin in these tumors. Together, our data suggest that regulation of CD44 alternative splicing causally contributes to EMT and breast cancer progression. Citation Information: J Clin Invest. 2011;121(3):1075-1087. https://doi.org/10.1172/JCI43505. Solid tumors contain hypoxic regions in which cancer cells are often resistant to chemotherapy-induced apoptotic cell death. Therapeutic strategies that specifically target hypoxic cells and promote apoptosis are particularly appealing, as few normal tissues experience hypoxia. We have found that the compound ABT-737, a Bcl-2 homology domain 3 (BH-3) mimetic, promotes apoptotic cell death in human colorectal carcinoma and small cell lung cancer cell lines exposed to hypoxia. This hypoxic induction of apoptosis was mediated through downregulation of myeloid cell leukemia sequence 1 (Mcl-1), a Bcl-2 family protein that serves as a biomarker for ABT-737 resistance. Downregulation of Mcl-1 in hypoxia was independent of hypoxia-inducible factor 1 (HIF-1) activity and was consistent with decreased global protein translation. In addition, ABT-737 induced apoptosis deep within tumor spheroids, consistent with an optimal hypoxic oxygen tension being necessary to promote ABT-737–induced cell death. Tumor xenografts in ABT-737–treated mice also displayed significantly more apoptotic cells within hypoxic regions relative to normoxic regions. Synergies between ABT-737 and other cytotoxic drugs were maintained in hypoxia, suggesting that this drug may be useful in combination with chemotherapeutic agents. Taken together, these findings suggest that Mcl-1–sparing BH-3 mimetics may induce apoptosis in hypoxic tumor cells that are resistant to other chemotherapeutic agents and may have a role in combinatorial chemotherapeutic regimens for treatment of solid tumors. Citation Information: J Clin Invest. 2011;121(3):1088-1101. https://doi.org/10.1172/JCI44960. Plasmacytoid DCs (pDCs) are innate immune cells that are specialized to produce IFN-α and to activate adaptive immune responses. Although IFN-α inhibits HIV-1 replication in vitro, the production of IFN-α by HIV-activated pDCs in vivo may contribute more to HIV pathogenesis than to protection. We have now shown that HIV-stimulated human pDCs allow for persistent IFN-α production upon repeated stimulation, express low levels of maturation molecules, and stimulate weak T cell responses. Persistent IFN-α production by HIV-stimulated pDCs correlated with increased levels of IRF7 and was dependent upon the autocrine IFN-α/β receptor feedback loop. Because it has been shown that early endosomal trafficking of TLR9 agonists causes strong activation of the IFN-α pathway but weak activation of the NF-κB pathway, we sought to investigate whether early endosomal trafficking of HIV, a TLR7 agonist, leads to the IFN-α–producing phenotype we observed. We demonstrated that HIV preferentially traffics to the early endosome in human pDCs and therefore skews pDCs toward a partially matured, persistently IFN-α–secreting phenotype. Citation Information: J Clin Invest. 2011;121(3):1102-1110. https://doi.org/10.1172/JCI44876. SIV infection of natural host species such as sooty mangabeys results in high viral replication without clinical signs of simian AIDS. Studying such infections is useful for identifying immunologic parameters that lead to AIDS in HIV-infected patients. Here we have demonstrated that acute, SIV-induced CD4+ T cell depletion in sooty mangabeys does not result in immune dysfunction and progression to simian AIDS and that a population of CD3+CD4–CD8– T cells (double-negative T cells) partially compensates for CD4+ T cell function in these animals. Passaging plasma from an SIV-infected sooty mangabey with very few CD4+ T cells to SIV-negative animals resulted in rapid loss of CD4+ T cells. Nonetheless, all sooty mangabeys generated SIV-specific antibody and T cell responses and maintained normal levels of plasma lipopolysaccharide. Moreover, all CD4-low sooty mangabeys elicited a de novo immune response following influenza vaccination. Such preserved immune responses as well as the low levels of immune activation observed in these animals were associated with the presence of double-negative T cells capable of producing Th1, Th2, and Th17 cytokines. These studies indicate that SIV-infected sooty mangabeys do not appear to rely entirely on CD4+ T cells to maintain immunity and identify double-negative T cells as a potential subset of cells capable of performing CD4+ T cell–like helper functions upon SIV-induced CD4+ T cell depletion in this species. Citation Information: J Clin Invest. 2011;121(3):1111-1118. https://doi.org/10.1172/JCI44182. During infection with the hepatitis A virus (HAV), most patients develop mild or asymptomatic disease. However, a small number of patients develop serious, life-threatening hepatitis. We investigated this variability in disease severity by examining 30 Argentinean patients with HAV-induced acute liver failure in a case-control, cross-sectional, observational study. We found that HAV-induced severe liver disease was associated with a 6-amino-acid insertion in TIM1/HAVCR1 (157insMTTTVP), the gene encoding the HAV receptor. This polymorphism was previously shown to be associated with protection against asthma and allergic diseases and with HIV progression. In binding assays, the TIM-1 protein containing the 157insMTTTVP insertion polymorphism bound HAV more efficiently. When expressed by human natural killer T (NKT) cells, this long form resulted in greater NKT cell cytolytic activity against HAV-infected liver cells, compared with the shorter TIM-1 protein without the polymorphism. To our knowledge, the 157insMTTTVP polymorphism in TIM1 is the first genetic susceptibility factor shown to predispose to HAV-induced acute liver failure. Furthermore, these results suggest that HAV infection has driven the natural selection of shorter forms of the TIM-1 protein, which binds HAV less efficiently, thereby protecting against severe HAV-induced disease, but which may predispose toward inflammation associated with asthma and allergy. Citation Information: J Clin Invest. 2011;121(3):1119-1129. https://doi.org/10.1172/JCI43457. Malaria caused by Plasmodium falciparum results in approximately 1 million annual deaths worldwide, with young children and pregnant mothers at highest risk. Disease severity might be related to parasite virulence factors, but expression profiling studies of parasites to test this hypothesis have been hindered by extensive sequence variation in putative virulence genes and a preponderance of host RNA in clinical samples. We report here the application of RNA sequencing to clinical isolates of P. falciparum, using not-so-random (NSR) primers to successfully exclude human ribosomal RNA and globin transcripts and enrich for parasite transcripts. Using NSR-seq, we confirmed earlier microarray studies showing upregulation of a distinct subset of genes in parasites infecting pregnant women, including that encoding the well-established pregnancy malaria vaccine candidate var2csa. We also describe a subset of parasite transcripts that distinguished parasites infecting children from those infecting pregnant women and confirmed this observation using quantitative real-time PCR and mass spectrometry proteomic analyses. Based on their putative functional properties, we propose that these proteins could have a role in childhood malaria pathogenesis. Our study provides proof of principle that NSR-seq represents an approach that can be used to study clinical isolates of parasites causing severe malaria syndromes as well other blood-borne pathogens and blood-related diseases. Citation Information: J Clin Invest. 2011;121(3):1130-1140. https://doi.org/10.1172/JCI43755. Kaposi sarcoma–associated herpesvirus (KSHV) is a B-lymphotropic virus whose primary site of replication is the oropharynx. KSHV can infect both T and B cells from primary tonsillar explant cultures. However, T cells do not support lytic replication, while B cells spontaneously produce substantial amounts of infectious virus. Here, we provide evidence for a mechanism by which activated T cells may promote or stabilize latency of KSHV infection in B cells. When mixed cultures of B cells and activated T cells were exposed to KSHV, little spontaneous virus production was observed. Removing T cells from the mix or treating the mixed culture with immune suppressants enhanced virus production. Adding back activated T cells to purified infected B cells efficiently suppressed KSHV production, primarily due to CD4+ T cells. This suppressive activity required T cell activation and direct cell-cell contact, but not prior exposure to KSHV antigen. Suppression was not MHC restricted and did not result in killing of the target cell. We therefore propose that oropharyngeal T cells activated by a variety of stimuli can recognize ligands on infected target B cells, leading to signaling events that prevent spontaneous lytic activation and promote latent infection in this compartment. Citation Information: J Clin Invest. 2011;121(3):1141-1153. https://doi.org/10.1172/JCI44417. Kaposi sarcoma herpesvirus (KSHV) is specifically associated with Kaposi sarcoma (KS) and 2 B cell lymphoproliferative diseases, namely primary effusion lymphoma (PEL) and multicentric Castleman disease (MCD). KS, PEL, and MCD are largely incurable and poorly understood diseases most common in HIV-infected individuals. Here, we have revealed the role of viral FLICE-inhibitory protein (vFLIP) in the initiation of PEL and MCD by specifically expressing vFLIP at different stages of B cell differentiation in vivo. Mice showed MCD-like abnormalities and immunological defects including lack of germinal centers (GCs), impaired Ig class switching, and affinity maturation. In addition, they showed increased numbers of cells expressing cytoplasmic IgM-λ, a thus far enigmatic feature of the KSHV-infected cells in MCD. B cell–derived tumors arose at high incidence and displayed Ig gene rearrangement with downregulated expression of B cell–associated antigens, which are features of PEL. Interestingly, these tumors exhibited characteristics of transdifferentiation and acquired expression of histiocytic/dendritic cell markers. These results define immunological functions for vFLIP in vivo and reveal what we believe to be a novel viral-mediated tumorigenic mechanism involving B cell reprogramming. Additionally, the robust recapitulation of KSHV-associated diseases in mice provides a model to test inhibitors of vFLIP as potential anticancer agents. Citation Information: J Clin Invest. 2011;121(3):1154-1162. https://doi.org/10.1172/JCI44198. HBV is a noncytopathic hepadnavirus and major human pathogen that causes immune-mediated acute and chronic hepatitis. The immune response to HBV antigens is age dependent: viral clearance occurs in most adults, while neonates and children usually develop chronic infection and liver disease. Here, we characterize an animal model for HBV infection that recapitulates the key differences in viral clearance between early life and adulthood and find that IL-21 may be part of an effective primary hepatic immune response to HBV. In our model, adult mice showed higher HBV-dependent IL-21 production in liver, compared with that of young mice. Conversely, absence of the IL-21 receptor in adult mice resulted in antigen persistence akin to that of young mice. In humans, levels of IL-21 transcripts were greatly increased in blood samples from acutely infected adults who clear the virus. These observations suggest a different model for the dichotomous, age-dependent outcome of HBV infection in humans, in which decreased IL-21 production in younger patients may hinder generation of crucial CD8+ T and B cell responses. These findings carry implications for therapeutic augmentation of immune responses to HBV and potentially other persistent liver viruses. Citation Information: J Clin Invest. 2011;121(3):1163-1173. https://doi.org/10.1172/JCI41651. Nicotinic acid (niacin) is a drug used to reduce the progression of atherosclerosis. Its antiatherosclerotic activity is believed to result from lipid-modifying effects, including its ability to decrease LDL cholesterol and increase HDL cholesterol levels in plasma. Here, we report that in a mouse model of atherosclerosis, we found that nicotinic acid inhibited disease progression under conditions that left total cholesterol and HDL cholesterol plasma levels unaffected. The antiatherosclerotic effect was not seen in mice lacking the receptor for nicotinic acid GPR109A. Surprisingly, transplantation of bone marrow from GPR109A-deficient mice into atherosclerosis-prone animals also abrogated the beneficial effect of nicotinic acid. We detected expression of GPR109A in macrophages in atherosclerotic plaques. In macrophages from WT mice, but not from GPR109A-deficient animals, nicotinic acid induced expression of the cholesterol transporter ABCG1 and promoted cholesterol efflux. Furthermore, activation of GPR109A by nicotinic acid inhibited MCP-1–induced recruitment of macrophages into the peritoneal cavity and impaired macrophage recruitment to atherosclerotic plaques. In contrast with current models, our data show that nicotinic acid can reduce the progression of atherosclerosis independently of its lipid-modifying effects through the activation of GPR109A on immune cells. We conclude therefore that GPR109A mediates antiinflammatory effects, which may be useful for treating atherosclerosis and other diseases. Citation Information: J Clin Invest. 2011;121(3):1174-1190. https://doi.org/10.1172/JCI43004. Acute lung injury (ALI) is a life-threatening condition in critically ill patients. Injury to the alveolar epithelium is a critical event in ALI, and accumulating evidence suggests that it is linked to proapoptotic Fas/FasL signals. Active soluble FasL (sFasL) is detectable in the bronchoalveolar lavage (BAL) fluid of patients with ALI, but the mechanisms controlling its bioactivity are unclear. We therefore investigated how the structure of sFasL influences cellular activation in human and mouse lungs and the role of oxidants and proteases in modifying sFasL activity. The sFasL in BAL fluid from patients with ALI was bioactive and present in high molecular weight multimers and aggregates. Oxidants generated from neutrophil myeloperoxidase in BAL fluid promoted aggregation of sFasL in vitro and in vivo. Oxidation increased the biological activity of sFasL at low concentrations but degraded sFasL at high concentrations. The amino-terminal extracellular stalk region of human sFasL was required to induce lung injury in mice, and proteolytic cleavage of the stalk region by MMP-7 reduced the bioactivity of sFasL in human cells in vitro. The sFasL recovered from the lungs of patients with ALI contained both oxidized methionine residues and the stalk region. These data provide what we believe to be new insights into the structural determinants of sFasL bioactivity in the lungs of patients with ALI. Priya Duggal, … , Stephen F. Porcella, William A. Petri Jr.
Citation Information: J Clin Invest. 2011;121(3):1191-1198. https://doi.org/10.1172/JCI45294. Malnutrition substantially increases susceptibility to Entamoeba histolytica in children. Leptin is a hormone produced by adipocytes that inhibits food intake, influences the immune system, and is suppressed in malnourished children. Therefore we hypothesized that diminished leptin function may increase susceptibility to E. histolytica infection. We prospectively observed a cohort of children, beginning at preschool age, for infection by the parasite E. histolytica every other day over 9 years and evaluated them for genetic variants in leptin (LEP) and the leptin receptor (LEPR). We found increased susceptibility to intestinal infection by this parasite associated with an amino acid substitution in the cytokine receptor homology domain 1 of LEPR. Children carrying the allele for arginine (223R) were nearly 4 times more likely to have an infection compared with those homozygous for the ancestral glutamine allele (223Q). An association of this allele with amebic liver abscess was also determined in an independent cohort of adult patients. In addition, mice carrying at least 1 copy of the R allele of Lepr were more susceptible to infection and exhibited greater levels of mucosal destruction and intestinal epithelial apoptosis after amebic infection. These findings suggest that leptin signaling is important in mucosal defense against amebiasis and that polymorphisms in the leptin receptor explain differences in susceptibility of children in the Bangladesh cohort to amebiasis. Priya Duggal, Xiaoti Guo, Rashidul Haque, Kristine M. Peterson, Stacy Ricklefs, Dinesh Mondal, Faisal Alam, Zannatun Noor, Hans P. Verkerke, Chelsea Marie, Charles A. Leduc, Streamson C. Chua Jr., Martin G. Myers Jr., Rudolph L. Leibel, Eric Houpt, Carol A. Gilchrist, Alan Sher, Stephen F. Porcella, William A. Petri Jr.
Citation Information: J Clin Invest. 2011;121(3):1199-1206. https://doi.org/10.1172/JCI45523. Obstructive and nonobstructive forms of hydronephrosis (increased diameter of the renal pelvis and calyces) and hydroureter (dilatation of the ureter) are the most frequently detected antenatal abnormalities, yet the underlying molecular mechanisms are largely undefined. Hedgehog (Hh) proteins control tissue patterning and cell differentiation by promoting GLI-dependent transcriptional activation and by inhibiting the processing of GLI3 to a transcriptional repressor. Genetic mutations that generate a truncated GLI3 protein similar in size to the repressor in humans with Pallister-Hall syndrome (PHS; a disorder whose characteristics include renal abnormalities) and hydroureter implicate Hh-dependent signaling in ureter morphogenesis and function. Here, we determined that Hh signaling controls 2 cell populations required for the initiation and transmission of coordinated ureter contractions. Tissue-specific inactivation of the Hh cell surface effector Smoothened (Smo) in the renal pelvic and upper ureteric mesenchyme resulted in nonobstructive hydronephrosis and hydroureter characterized by ureter dyskinesia. Mutant mice had reduced expression of markers of cell populations implicated in the coordination of unidirectional ureter peristalsis (specifically, Kit and hyperpolarization-activation cation–3 channel [Hcn3]), but exhibited normal epithelial and smooth muscle cell differentiation. Kit deficiency in a mouse model of PHS suggested a pathogenic role for GLI3 repressor in Smo-deficient embryos; indeed, genetic inactivation of Gli3 in Smo-deficient mice rescued their hydronephrosis, hydroureter, Kit and Hcn3 expression, and ureter peristalsis. Together, these data demonstrate that Hh signaling controls Kit and Hcn3 expression and ureter peristalsis. Citation Information: J Clin Invest. 2011;121(3):1207-1216. https://doi.org/10.1172/JCI43868. HSCs either self-renew or differentiate to give rise to multipotent cells whose progeny provide blood cell precursors. However, surprisingly little is known about the factors that regulate this choice of self-renewal versus differentiation. One candidate is the Notch signaling pathway, with ex vivo studies suggesting that Notch regulates HSC differentiation, although a functional role for Notch in HSC self-renewal in vivo remains controversial. Here, we have shown that Notch2, and not Notch1, inhibits myeloid differentiation and enhances generation of primitive Sca-1+c-kit+ progenitors following in vitro culture of enriched HSCs with purified Notch ligands. In mice, Notch2 enhanced the rate of formation of short-term repopulating multipotential progenitor cells (MPPs) as well as long-term repopulating HSCs, while delaying myeloid differentiation in BM following injury. However, consistent with previous reports, once homeostasis was achieved, neither Notch1 nor Notch2 affected repopulating cell self-renewal. These data indicate a Notch2-dependent role in assuring orderly repopulation by HSCs, MPPs, myeloid cells, and lymphoid cells during BM regeneration. Citation Information: J Clin Invest. 2011;121(3):1217-1221. https://doi.org/10.1172/JCI44635. Citation Information: J Clin Invest. 2011;121(3):1222-1222. https://doi.org/10.1172/JCI46407. Citation Information: J Clin Invest. 2011;121(3):1223-1223. https://doi.org/10.1172/JCI57501.